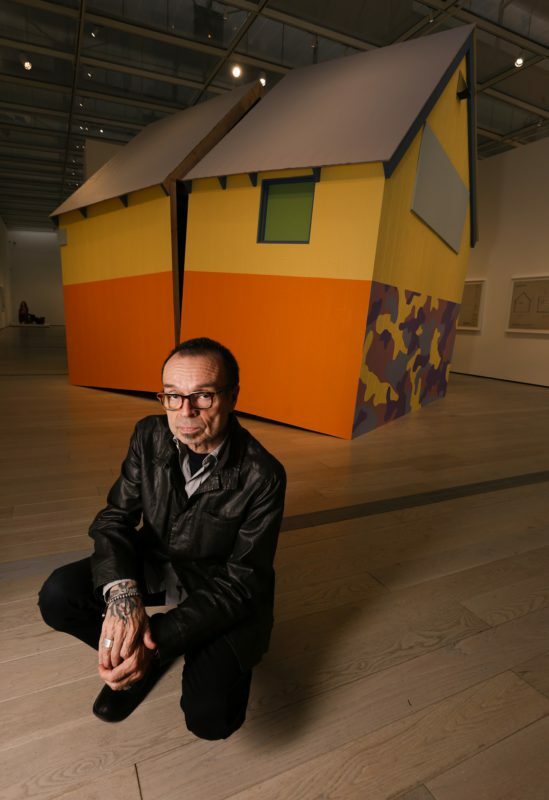 On the surface, the brightly painted shed recently installed in the galleries at the Los Angeles County Museum of Art couldn’t seem more appealing. Sherbet-y shades of orange and yellow greet the viewer. Around the rear, a belt of camouflage employs candy shades of purple. A door is rendered a grassy green. But study this structure for a bit and it becomes unsettling. The building is split down the middle, as if it’s about to fall apart. And if the design has echoes of the familiar it’s because you may have seen something like it on the news: The piece is a scale replica of “Unabomber” Ted Kaczynski’s cabin in the Montana woods — except this one is painted in colors from Martha Stewart’s Signature paint collection. The sculpture is a work by Los Angeles artist Daniel Joseph Martinez and it unites, in one fractured monument, the legacies of two highly recognizable American figures. “One is Kaczynski,” Martinez says. “He believes that technology is a threat, so he blows up scientists — homegrown American terrorism. And there is Martha Stewart, who advances hypercapitalism. 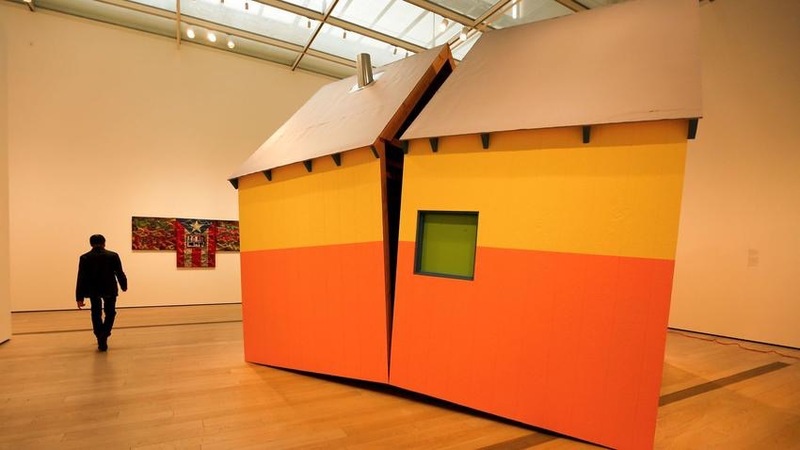 “The House America Built,” as the piece is titled, is part of the new LACMA exhibition “Home — So Different, So Appealing,” which brings together artists from throughout the Americas who are using elements of the domestic (say, a cabin) to comment on larger social and political issues. In the case of Martinez’s shed, the state of the homeland. The show is the first of the Pacific Standard Time: Los Angeles/Latin America exhibitions, the regional series funded in part by the Getty Foundation, and more informally known as PST: LA/LA. “Home” is the early outlier in the series, which is set to officially debut in the fall, when an estimated 70 cultural institutions around Southern California will have programming related to Latino and Latin American culture. This will include an exhibition about pre-Columbian societies at the Getty Center and work by avant-garde female artists at the Hammer Museum — as well as shows on Chicano muralism, South American kinetic art and historic illustrations of Latin American flora, among countless others. Even the Los Angeles Philharmonic has gotten in on the action. The orchestra will present a series of concerts for PST: LA/LA featuring work by contemporary Mexico City composers. It will also collaborate with celebrated Mexican rock band Café Tacvba and L.A.’s La Santa Cecilia for a kickoff show at the Hollywood Bowl. If “Home” is a harbinger of what to expect for the rest of the series, it has set the bar high. Few museum exhibitions synthesize currents in contemporary Latin American art. And the ones that do often center on questions of identity — be it ethnic or regional — or around a particular artistic movement, such as abstraction. The exhibition features roughly 100 works by some 40 artists from all over the continent — including Latino artists from various corners of the U.S. And it shows the ways in which these artists, who span several generations (there are works dating back to the 1950s) have explored a range of global concerns. This is not a show in which Latino artists just dwell on being Latino. It is about ideas: ones that flow from south to north and east to west and vice versa. The show engages issues such as colonialism, migration, inequity, vernacular construction (of the sort that powers many Latin American urban centers) and the ways in which architecture can serve as a tool of the state. A second prominent sculpture by Martinez, for example, looks at how the urban design of cities such as Irvine, Calif., with their dead-end streets and gated communities, influenced the layout of Israeli settlements in Palestinian territories in the Middle East. 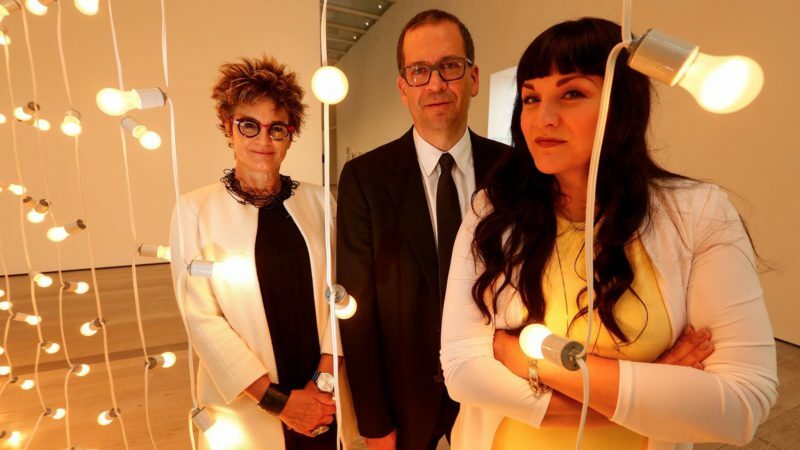 “Home” was organized by Ramirez, a curator of Latin American art at the Museum of Fine Arts Houston, as well as Chon Noriega, of UCLA’s Chicano Studies Research Center, and Pilar Tompkins Rivas, director of the Vincent Price Art Museum at East Los Angeles College. In conceiving the show, the three say they stayed away from the idea of doing a show that was “about” Latin America. In other words, the process of migration — the search for home. A pair of wall-hangings by Raphael Montañez Ortiz, a U.S. artist of mixed Caribbean and Mexican heritage who made some of his key works in the 1960s, for example, hang adjacent to an installation by Colombian artist Leyla Cardenas, who has been active for just over a decade. Both pry apart domestic settings to examine their psychological and historical roots. Ortiz’s pieces, which he labels “Archaeological Finds,” consist of dismembered furnishings that he pries apart in violent acts. 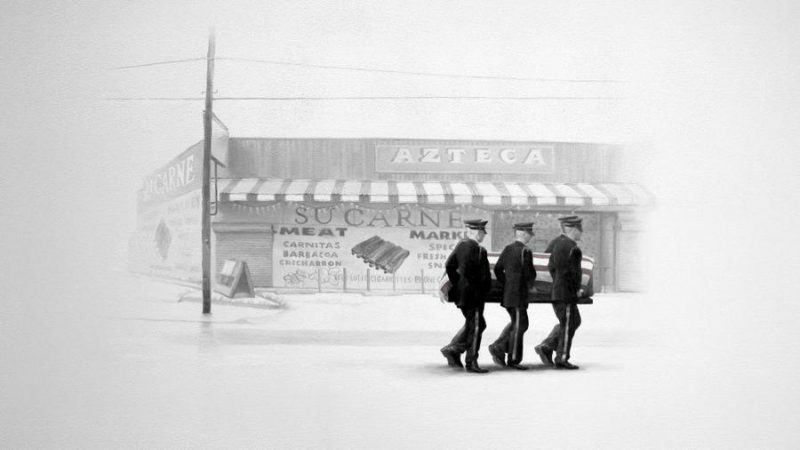 Cardenas uses elements of old architecture to conduct what amounts to archaeological digs. Taking slivers of a decaying 19th century house from Bogotá, she’s peeled away layers of wallpaper to reveal decorative elements dating back to the early republic. The structure was made of wood and adobe, in the Spanish style, but the wallpaper added after independence is English. It marks a moment in which Colombia was searching for a new identity apart from Spain. All of this she presents as a 4-inch-wide slice of a room that looks like a laboratory specimen on an architectural scale. 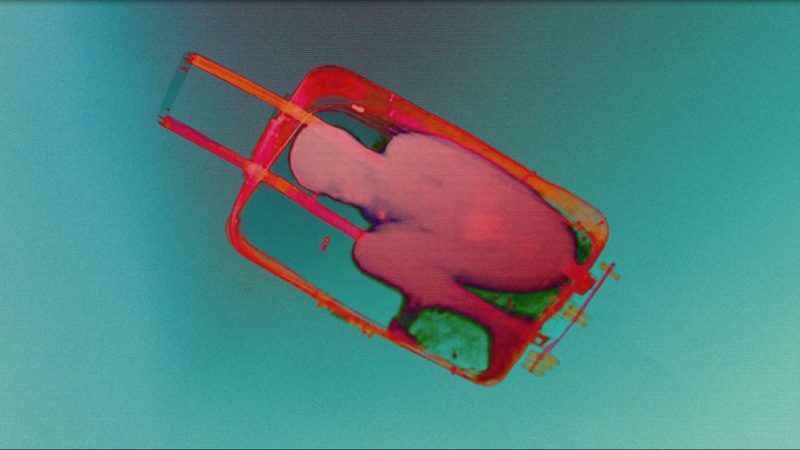 Other galleries tackle the urban realities of Latin American cities. 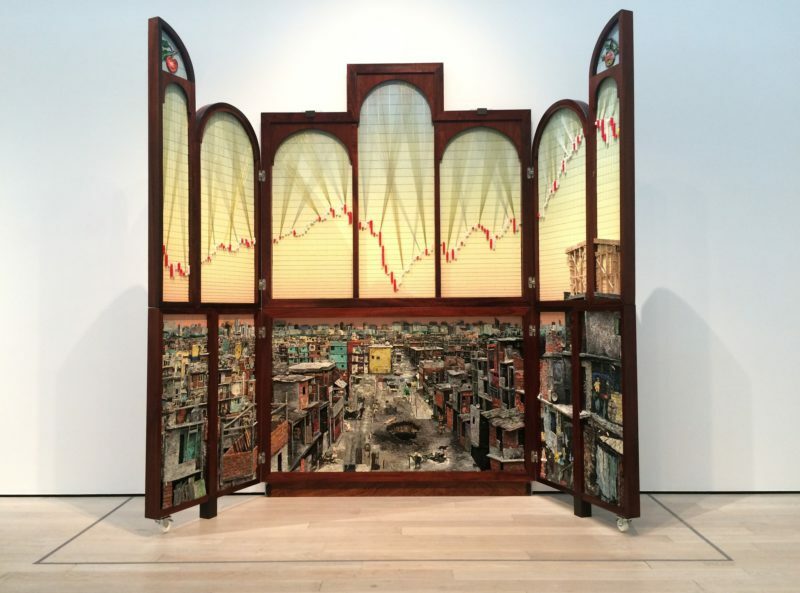 A 2014-16 sculpture — modeled on Jan van Eyck’s 15th-century Ghent altarpiece — by the contemporary Argentine collective Mondongo, for example, portrays Buenos Aires’ glittering downtown within view of the shantytown known as Villa 31. In the same gallery hangs a piece by Antonio Berni, also Argentine, who in the 1960s made assemblages out of detritus that chronicled slum life. 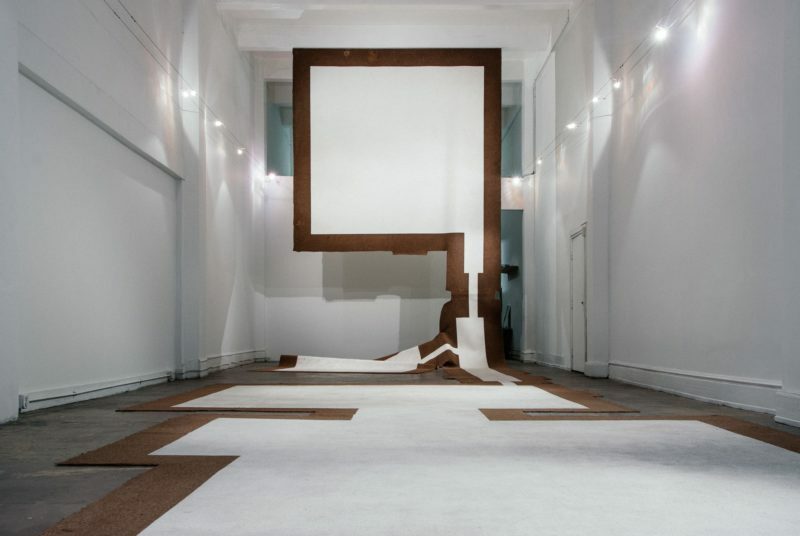 A couple of rooms over, a large installation by prominent Mexican contemporary artist Abraham Cruzvillegas explores the related idea of autoconstrucción, or self-construction. 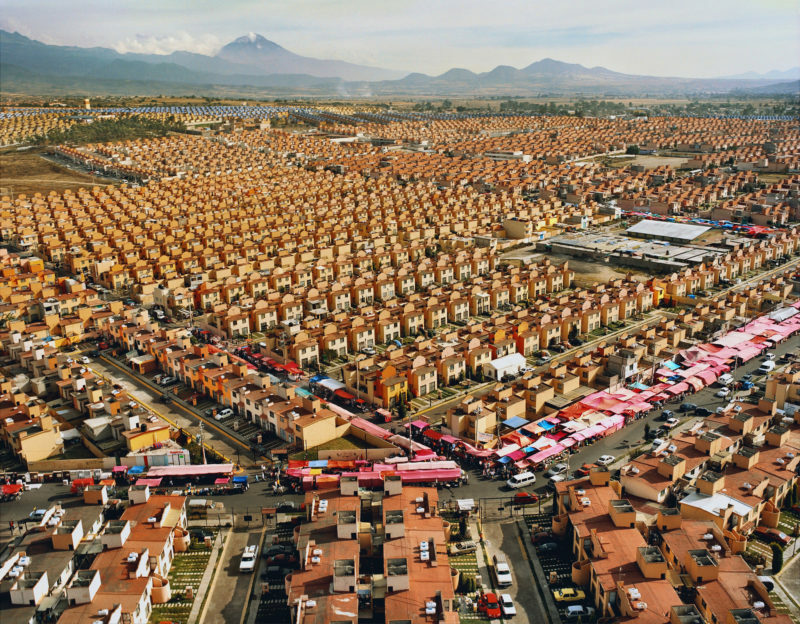 Cruzvillegas grew up in a squatter community outside of Mexico City in which everything was built, over time, by the residents. It offers an intriguing counterpoint to Martinez’s sculptures about Israeli settlements: the creation of home from the ground up rather than top down. Representing the U.S. are figures such as Martinez, as well as Puerto Rican American Juan Sánchez, who explores the political status of Puerto Rico in his mixed media paintings (a timely subject), and Carmen Argote, a Mexican American artist from Los Angeles, who has turned the rug from her childhood home into a massive wall sculpture that plays with form and memory. In the museum’s gardens, an installation by Cuban American artist María Elena González examines the architecture of public housing in the United States. Her piece, looking like a giant magic carpet, depicts to scale the layout of the apartments at Nickerson Gardens in Watts. As with other artists in the show, her concerns are as local as they are international. But in the age of the Internet and globalized everything, the strict separation no longer makes sense — especially with Latin American artists pursuing degrees in the U.S., and Latino artists traveling to Latin America for exhibitions and residencies. “For younger artists, they’re dealing with home as an idea of the transnational,” says Tompkins Rivas. “There are shared histories of language and colonialism and what it means to be Latino or Latin American,” Noriega adds. The show — along with others that will be part of PST: LA/LA, such as the Hammer’s “Radical Women”— is looking to close the gap between the Latino and the Latin American. “Latino artists have had a low visibility in Latin American circles,” Tompkins Rivas says. “Home” represents an intriguing argument for the more nuanced ways in which U.S. institutions can present work by Latino and Latin American artists, whose representation in major museums is often weak. For curators around the country, perhaps it’s a good time to pay Los Angeles a visit.